Your diet and any diseases that afflict you are, without a doubt, intertwined. In my case, last January I weighed in at 227 pounds. At six-foot-three, that’s overweight, but not obese. I wasn’t much concerned until my blood pressure checks, when I donated blood, started getting higher than the allowed maximum. I was always able to get a low enough blood pressure after waiting a few minutes and and checking my blood pressure again. But still . . . 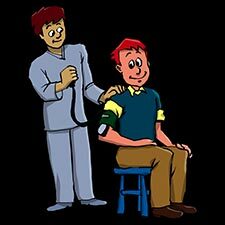 I found that blood pressure is a symptom. It makes no sense to me to be treating symptoms like doctors typically do. Sure, various drugs and even red rice yeast can lower blood pressure, but so what – if the underlying problem remains. At the time I was getting physical therapy for sciatica. Being overweight can be a cause of sciatica. The pain of sciatica can also lead to high blood pressure. My issues with plantar fasciitis can also be caused by excess weight. Further, excess weight can be a direct cause of high blood pressure. With all this in mind, I decided it was time to lose some weight. The most obvious and first thing that comes to mind when deciding how to lose weight is diet. What diet should I try? In the past low carbohydrate diets have worked for me, but this time my focus was on blood pressure reduction. That led me to the DASH (Dietary Approaches to Stop Hypertension) Diet. After studying a couple of books, The Dash Diet Weight Loss Solution: 2 Weeks to Drop Pounds, Boost Metabolism, and Get Healthy by Marla Heller and The Everyday DASH Diet Cookbook: Over 150 Fresh and Delicious Recipes to Speed Weight Loss, Lower Blood Pressure, and Prevent Diabetes also by Heller, I decided to give it a try. During the first couple of weeks, the DASH diet excludes a few things that lead to rapid weight loss to get you started. After that you can begin eating fruit and a few other things again and the rate of weight loss goes down. I’m not that great at following a strict diet so I boiled it down to dropping sugar, bread and salt from my diet. Well, I love sugar. For help weaning ones self off of sugar, Heller recommends sugar free Jello. I ate quite a lot of that for the first two weeks and whenever I wanted sugar thereafter. I also love bread. The DASH diet allows whole grain bread, but even the ingredients in the best bread products suggest that they aren’t particularly good for you. I cut out bread for a few months and have only recently started eating some. In the interim and even now, I make my own waffles using Bob’s Red Mill Gluten Free All Purpose Baking Flour. Its a a blend of garbanzo bean flour, potato starch, whole grain white sorghum flour, tapioca flour and fava bean flour. It you want to make bread out of it, you may need to add xanthin gum or guar gum to the mix. Dump everything in a bowl and stir it with a big spoon until its fairly smooth. Cook on a waffle maker according to its instructions. I like covering my waffles with real maple syrup, but honey butter is also great on them. Sure, it’s sugar, so don’t eat these every day! I never added much salt to anything, Instead I used Spike seasoning. I turns out that Spike has a lot of salt in it. I switched to salt-free Spike. What seems to happen with this diet is that eventually cravings for sugary foods recedes. Keeping ready-to-eat turkey or ham or boiled eggs around for snacks helps a lot. I followed the recommended new version of the DASH diet strictly for the first couple of weeks and lost ten pounds. Some of that loss is, I suspect, from the reduction in salt consumption and reduced water retention. After that I began to feel less inclined to eat a lot of snacks or between meals. Now I typically eat two meals a day – a morning meal between 10am and noon and an evening meal between 6 and 8 pm. I also find myself not eating as much at each meal. I eat a lot of sea food, particularly fish, along with eggs and turkey and not much in the way of heavy duty carbohydrates (bread, potatoes, pasta etc.). Some people get all excited about the initial loss of weight, and get off the diet after two weeks. That doesn’t work – you’ll gain the weight right back. Instead, this diet and others like it, rely more upon a lifestyle change where you start eating healthy foods and avoiding all the junk that marketers keep pushing on us. My typical morning meal is made of multiple chopped vegetables (onions, cauliflower, broccoli, sweet peppers, carrots, celery, etc) and mushrooms stirred with eggs. That’s basically a frittata, but I don’t bother with baking it. I just get the vegetables started then add the eggs toward the end. I keep stirring the concoction in the pan on the stovetop until the eggs are properly cooked. I add lots of salt-free Spike along the way. In the evening I like baked fish with vegetables. One of the things that happens when eating between, in my case, the hours of 10am and 8 pm is that there is a 14 hour period every day without food. This gives the body time to use up any sugar and switch to burning fat for fuel. This approach also helps prevent insulin resistance and ultimately diabetes. In addition, morning exercise, before eating, ends up burning fat. 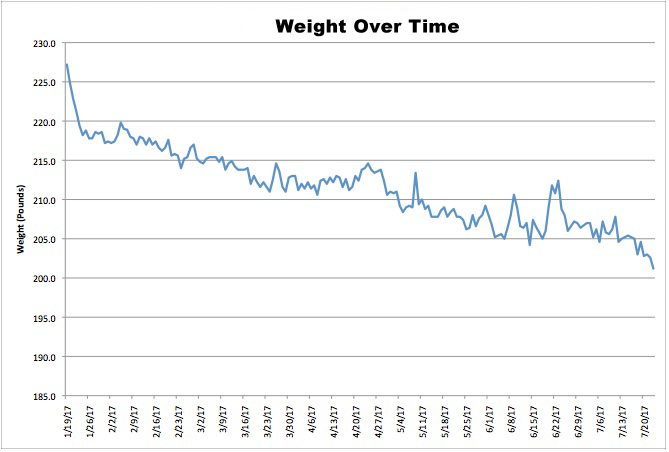 As you can see the weight loss is not steady. Some of those peaks are pretty demoralizing. 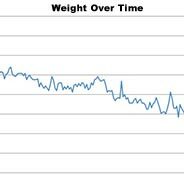 However, I check my weight every day and used those peaks as motivation to watch my diet more closely. If your weight loss stalls, you can go back to the restrictions of the first couple weeks to get back on track. My cardiologist seemed to think my weight at 209 pounds was just fine. Nonetheless, I still have plenty of fat and have the goal of reaching 200 pounds. Since I’m almost there, I expect to set my goal even lower. There are a lot of formulas for calculating ideal weigh. I find my ideal weight to be between about 170 and 195 pounds. Perhaps my next target will be 185. Once I get there I’ll reassess my body and adjust as appropriate. If I tend to keep losing weight when I get to the proper weight, I’ll need to increase my calorie intake by eating more of the foods on the diet. You can find your ideal weight range using the Ideal Weight Calculator. My blood pressure at my cardiologist’s office is fine, but it tends to still be little high when I donate blood. My doctor thinks Red Cross has a problem with their sphygmomanometers. Then again, I still have some excess weight to lose. The DASH diet was developed by scientists based upon solid research results. It’s very likely to work for you, especially if you follow it religiously. It’s clearly a low carb/healthy fat diet. These types of diets tend to convert the body from burning sugar for energy to burning fat for energy, thus the long-term weight loss. It is quite similar to the South Beach Diet, Atkin’s Diet and ketogenic diets. In any of these diets you need to cut way back on sugar and starch along with packaged and processed foods. You need to get back to real foods – certified organic foods will help even more. While the DASH diet includes dairy products, other diets avoid milk, in particular, due to its high carbohydrate levels in the form of galactose. The Mayo Clinic has a summary of the DASH Diet and sample menus for the DASH diet. Dr. Oz provides some additional information about the Dash diet and a seven day meal plan. If you decide to follow the DASH diet, I’m pretty sure you will see significant weight loss over time. I do recommend that you record your weight every day and stick as closely to the diet recommendation as you can. I also recommend the two books I mentioned above, however you can get the knowledge you need from the “Learning More” section above at no cost.